Mazda has issued a statement to the press regarding an accident which appened Sunday, November 10, in the parking lot of a dealership in Fukaya City, Saitama, Japan. 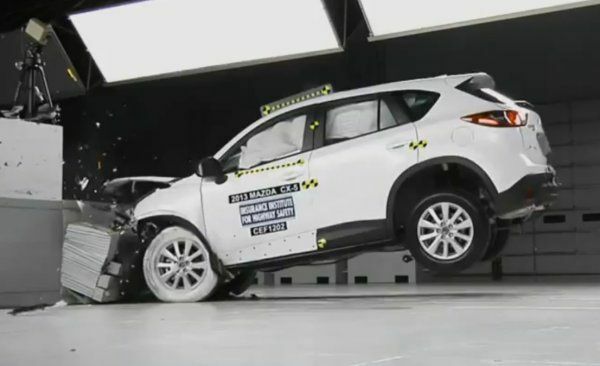 The dealership, Sakata Jidosha Kogyo, was conducting a safety features demonstration to a customer with a CX-5 crossover when the crossover crashed, causing whiplash to the driver (customer) and a broken arm for the dealership's employee. Sakata Jidosha Kogyo runs three Mazda Autozam dealerships in the Saitama prefecture and held the demonstration Sunday to show new customers how the advanced safety features of their CX-5 work. These include Smart City Brake Support (SCBS), which is supposed to stop the vehicle at low speeds when a collision is imminent. Mazda has not said if the SCBS failed to detect the fence, if it was accidentally de-activated, or what happened in the crash, which is under investigation by the police. Mazda's account gives quick information about the accident itself, saying that "The circumstances and causes of this accident, including whether or not the demonstration test drive event held by Sakata Jidosha Kogyo followed Mazda's guidelines, will be revealed by the ongoing police investigation." To Mazda's credit, no reports in Japan, Europe, or the Americas of failures in the SCBS have been received, so it's not likely that this was the cause. In my own week-long test of the new 2014 Mazda6, equipped with SCBS, as a press loan, I found it to work quite well when used as intended. Most likely, the investigation will find that the dealership failed to comply with the demonstration procedures for the system. It is not intended to detect "open" objects such as chain link fencing nor does it operate at higher speeds. Whatever the circumstances, Mazda now has a potential public relations nightmare on their hands should this be taken out of context by the press.